Jack O'Connor mused in the 1965 Complete Book of Shooting commented that the upland gun should center its patterns about one foot high at 40 yards. Mr. O'Connor further wrote that, “Then the upland gunner who mounts his gun fast can hold on the right on a rising pheasant or quail and nail it.” Some odd comments from Jack O'Connor there, as well as the notion that a pheasant is hard to kill at 45 yards with "anything." The O'Connor Arizaga 28 gauge mysteriously changed from 5-1/2 lbs. to 6 lbs. from page to page, and this variable weight Arizaga became 5-3/4 lbs. in O'Connor's The Shotgun Book. O'Connor's notion that he wouldn't have an upland gun that weighed over 7 lbs. is one that most people today would embrace. When I was younger, we had no bird dogs. We also walked standing corn. As the rows weren't planted as close together as they are today, it presented little problem. It was standard practice to shoot them once on the way up and again on the way down, for a bird that was a runner, even for a very short distance, would likely be a lost bird. Farming practices have changed dramatically, and today without a dog in Illinois you would just walk past many birds. Pheasant distances vary widely. With short ground cover, it is often easy to quickly pick up a rising bird so distances are commensurately short. In the case of tall grass or deep ditches, nervous roosters can jump at any range and they do just that. If you are blocking a section, the smarter roosters (that are more inclined to run more than fly) can break at any range, so longer shots can be standard fare. Pheasants under unspooked conditions don't fly particularly fast: in the area of 25 - 35 mph when leaving cover to go out to feed and returning to tall grass. When pursued, however, it is a different story: airspeed of over 70 fps (about 50 mph) for short distances. 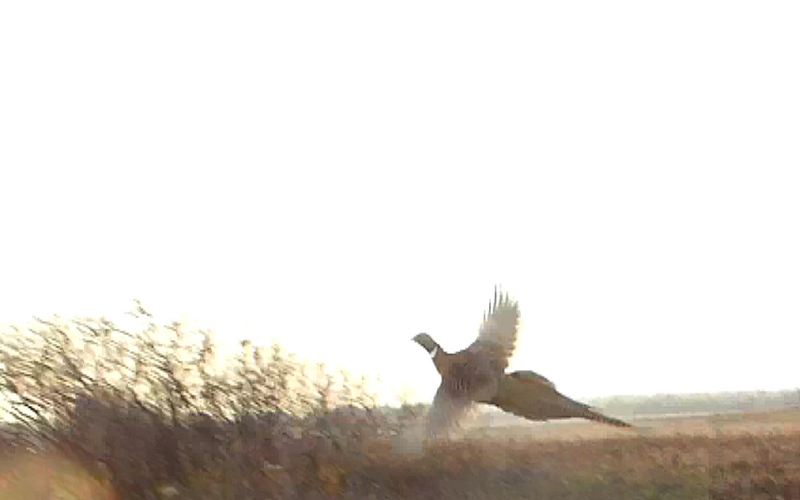 A spooked rooster hitting the air at 30 yards may well be past 55 yards about one second later. On a windy day, your shooting window gets even shorter, as with a 25 mph tailwind the ground speed of a wild pheasant can exceed 110 fps: that's over 36 yards in one second. Added to the mix is the angle of the bird itself. In formal driven British shoots, #6 or #7 shot is often suggested, even though that equates to American #7 or #8 shot and would perhaps be appropriate for dove, but not for pheasant. But, I'm not shooting released birds and there are no pheasant beaters. Incoming pheasant is a rarity; there is a lot more tissue to get through when your target consists primarily of tail and back. Invariably, the pheasants taken in this area have crops well-stuffed with corn. They are constantly packing on mass, feathers, and fat. With an average high of forty-nine degrees in November, thirty-five degrees in December, and the first one inch snowfall doesn't happen until December 2, on average. While deep cover is an issue, available and accessible food rarely is. While shooting distances don't change, birds are heavier and tougher later in the year as they are corn-gobbling maniacs. Although Jack O'Connor's notions of patterning, guns that shoot excessively high, and shell selection are hard to fathom: his opinions on the weight and handling of a pheasant gun still make perfect sense. There is no such thing as hunting pheasants with shotguns “premounted,” we don't get to call for the bird, and pheasants don't slow down. Jack liked 25 to 26 inch barrels in his doubles, 24 to 26 inch barrels in his repeaters. Recommending a barrel length with precision isn't possible, as there is barrel weight to consider along with the additional length of the action in a repeater. My version of available, affordable, excellent handling pheasant guns would include the 6-1/2 lb. 28 in. Cynergy Field 20 gauge O/U, 6-1/4 lb. 26 inch barrel Beretta 303 or Browning B-80 20 gauges, the 6 lb. 24 inch Benelli M2 20 gauge, and a plain-barreled Browning A-5 Mag Twenty that is right at 6 lbs. 5 ounces. Weights and balances of shotguns can bit a bit misleading at the gun shop, for they aren't in the condition that we are actually going to carry them in. You can add in the extra inch of extended choke tubes to the barrels, and you can also add in the weight (and balance shift) of the two or three shells that are loaded into it when we actually carry them in the hunting field. If your gun seems a quarter pound heavier when you use it and its balance is a bit farther forward than you originally thought, it may not be your imagination after all. Lots of folks like the idea of the “all-around” shotgun. There is no such thing, for the crescent wrench of shotguns invariably means detrimental compromise. Lot of things can work, but merely “can work” is not often the definition of what you would want to use in a sport. The Benelli Vinci, though unusual in appearance at the enjoyable weight limit, comes to the shoulder exceedingly well at least for me, and has better shell-handling than the “cycle them all through” approach required by the M2. The new Browning A5, also 12 gauge only at this juncture, at just over 6-1/2 lbs. is the lightest Browning repeater since the Double Auto and also fits into the fun to carry arena, even if I did personally screw-up by initially going with a 28 inch barrel example. Like all inertia actions, the receiver of the new A5 is overly long and 26 inch would have been a better pheasant barrel length, perhaps even 24 inch if Browning decides to offer one. Shell-handling and safety operation with gloved hands is something you might overlook as well, until you are out in the field with cold, gloved hands that is. The reason for buffered 1-5/16 oz. 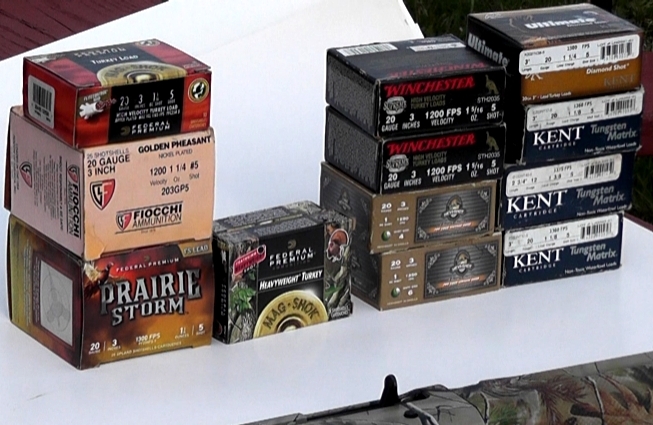 20 gauge shotshells is simple: compared to 1 oz. loads, you have 31% more pattern. Pheasant hunting is at unpredictable ranges and there is no reason to pass up a better than 30% pattern improvement. Hardly a disadvantage compared to a 12 gauge, the patterns with moderate velocity, buffered high antimony 20 gauge loads can easily be 50% more efficient than 12 gauge generic, chilled shot, "super pheasant" type loads. We know from the extensive mortality studies at Patuxent and at Nilo that #4 lead is the most effective pellet size tested on game farm mallards, at least the Ed Lowry take-away on it. The Bellrose Study was discussed in Oberfell & Thompson, suggesting 45 yards as the 95% bag percentage on mallards. The Nilo Lethality Model, as presented by Bob Brister, used an 80% bag rate, was 43 yards with 1-1/4 oz. #4 lead out of a full choked 12 gauge. There is some disagreement, however. Tom Roster wrote that the Nilo load was "too good": it was the Super-X Double Magnum grex-buffered 1-1/2 oz. high antimony #4 lead load capable of 90% 40 yard patterns, where Mr. Roster claimed 95% of hunters use soft, unbuffered shot loads that struggle to net 70% patterns. Robert L. Cochrane revisited the Patuxent and Nilo data in Wildlife Monographs No. 51 of November, 1976. At 30 – 60 meters, up to just over 65 yards, Cochrane rated the “Patuxent #6 lead” shotshell as having better performance compared to the Nilo #4 lead load. Confused yet? Adding to the mess is that #5 lead was not tested, just #4 and #6. Also, we know that a game farm mallard is not the potential runner that a pheasant is, and the only pheasant test of substance was by Tom Roster, using 1 oz. steel loads and pen-raised, released birds. To this day, no scientific study of lead shot lethality on wild pheasants with any representative sampling has ever been conducted in the United States. We do know that larger lead pellets penetrate better, though, and that larger pellets break bones better. We also know that pattern percentages can be compared and that while the larger the lead pellet, the more lethal it is. This is eternal compromise between singular pellet lethality and pellet count necessary to properly populate a pattern. Buffered number 5 lead is generally the best compromise; the three best patterning 20 gauge lead loads I've seen (and used) are the 1-5/16 oz. Winchester and Federal “turkey” loads, along with the Kent 1-1/4 oz. “turkey” load, all with number 5 shot. In 12 gauge, just adding more shot as you see in several “super pheasant type loads” does not necessarily mean a better load, just like in the “too good” buffered Nilo load. The B & P MB Long Range nickel-plated 1-1/4 oz. #4 shell is ideal. Although a “#4” load, it is British number 4: more like an American “#4-1/2” in practice, so the pellet count is still within a few pellets of many 1-1/4 oz. #5 loads. Aside from hard, spherical shot, buffering is one of the few things that makes an easily noticeable difference in shotshells. The high velocity 1-3/8 oz. soft lead pheasant loads are often pitiful patterning loads. Compare yourself with, for example, the Winchester STH125 shell (1300 fps, 2-3/4 in., 1-1/2 oz. buffered #5) on your patterning board and you'll be amazed. This is the current version of the “too good” Nilo load. Before screw-chokes became popular, controlling pattern diameter was done with the shell. If you reload, you can slit your wads to suit your tastes, use spreader wads, and use a faster muzzle velocity (and faster-opening pattern) from your first shell to net a more open pattern from the first shell, followed by a buffered short-slit load for the follow-up shot. It does work, but it is all based on the premise that the first shot is going to be a closer shot and that nervous roosters don't hit the air at 40 yards. In practice, I've found it to be more trouble than its worth so I'll choke and load for the longer ranges which may (or may not) be the first shot that you take. The same goes for O/Us or Side by Sides with single triggers. Though the two pattern option sounds good, instant selection on a flushing bird is an instinctive action, so far as I'm concerned double triggers give that choice far better than the "trying to slide the safety back and forth before knocking it off' type of clumsy attempt. The minimalist approach to pheasant hunting isn't what I aspire to; dead in the air and one hundred percent recovery is the goal even if it takes more payload, pattern density, and an extra shot to ensure it. It is far more satisfying that way.